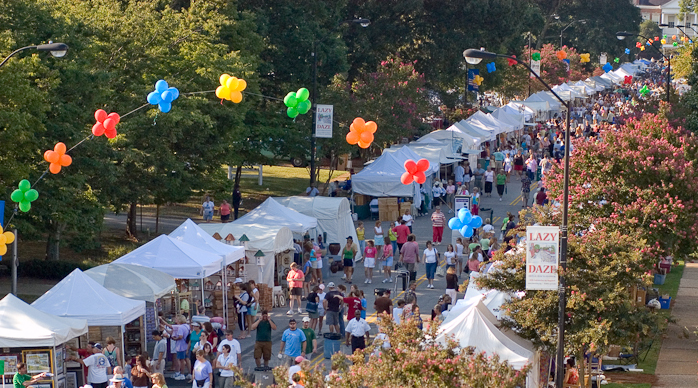 This year is going to be the 37th Annual Lazy Daze Arts and Crafts Festival in Cary, NC. Lazy Daze will be held on Saturday, August 24th from 9 am until 5 pm. There are musical entertainers, craft tutorials, a kids zone, local art vendors and so much more! If you have never been before, then I highly recommend that you check it out! All artists and vendors have to be from North Carolina, what better way to support local business?! Giving back to a local business stimulates the economy more so than heading out to Walmart to do some last minute shopping for a present or item for yourself. The morning kicks off with the Town Crier making a proclamation, followed by a performance by both Green Hope and the Cary High School Marching Band. I cannot think of a better way to spend the weekend with my family! Posted on July 5, 2013 by marykim1 •	This entry was posted in Uncategorized. Bookmark the permalink.